Picture the scene: The labelling machine at an automotive supplier is printing and applying labels with product information to help monitor the maintenance of lambda sensors. One by one, boxes leave the production warehouse. But when they are opened at the car manufacturing plant, a nasty surprise awaits the fitter: the machine was not aligned properly. The barcodes are overhanging slightly. High temperatures in the warehouse have caused the protruding parts to ripple and stick together. The product information is no longer comprehensible. A solution must be found. In this article you will discover how RFID cable ties withstand harsh production conditions and how this makes your production more secure and more efficient. The solution to the problem came in the form of the RFID cable tie from HellermannTyton. The RFID technology (Radio Frequency Identification) transfers information wirelessly, by means of low and high-frequency radio waves, as well as UHF (ultra-high frequency). RFID cable ties from HellermannTyton are also fitted with a passive transponder and work without any additional power supply. Depending on the material – plastic or metal – they are suitable for areas in which they need to be particularly durable or resilient. 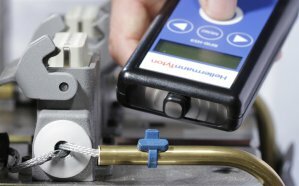 “Our customer who prints onto the lambda sensors has until now only been recording the date, employee, shift and value of the lambda sensor using conventional labelling. Then the barcodes are applied by a machine and subsequently sent to the plant. Here the data is read and built into the vehicle with the sensor,” explains Marco Schaffer. “Using RFID cable ties saves the customer the stage of applying the barcodes on site.” In addition, new machines for labelling that meet the specific requirements of the customer will no longer be needed in future. Because the RFID chip has a globally unique number other new processes are possible. This means the chip can be recorded in advance and managed using a conventional database or piece of software. A special programme is not required. RFID cable ties open up entirely new prospects and opportunities in digitised industrial applications. RFID cable ties can be used when other labelling methods are not suitable or do not reliably stay in place. RFID cable ties can be read in harsh environments – unlike barcode labels that often become illegible over time. 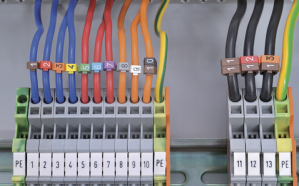 RFID transponders in metal cable ties can withstand harsh production environments. They are durable and minimise the risk of having the wrong product information. As a storage medium and information carrier they can be used to identify parts, tools, their whereabouts, characteristics or even contents.